Losing your teeth is one matter, but living without teeth for an extended period of time is quite another. That’s why we strongly recommend that patients start considering their reconstructive options as soon as possible – and our highly experienced doctors at Roselle Park Dental & Implants are here to help! Dr. Oshidar highly recommends dental implants as the top-tier solution to missing teeth, and our Roselle Park, NJ practice offers Teeth in a Day so that we can help you regain your full, strong smile in record time. Please contact us today here in Roselle Park, NJ if you have any questions for our team, or if you’re ready to schedule your first appointment. We’ll evaluate your smile, explain all of your tooth replacement options, and help you find the best solution for your unique oral health care needs. Teeth in a Day is a unique dental implant supported denture process. Rather than removing teeth, then placing dental implants, then designing the denture, then attaching the denture over the course of months, Teeth in a Day streamlines the process. 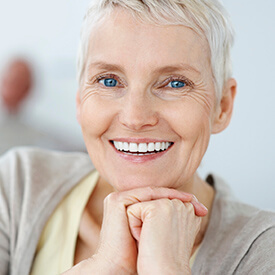 Instead of placing implants and asking patients to spend months without teeth, we will immediately place a traditional removable denture or an immediate load implant-retained removable denture. In most cases, you’ll need to have your denture adjusted or replaced once your smile has fully healed before we permanently attach the denture. Who Should You Consider Teeth in a Day? Any patient who is missing all of their teeth or who will soon have teeth extracted, may want to consider Teeth in a Day. Healthy patients who have chosen to proceed with these procedures immediately following tooth loss will have the highest chances for success. How Does Teeth in a Day Work? While the traditional implant process can take upwards of four to nine months to fully complete, Teeth in a Day can give you everything you need by the time you’re ready to leave our practice. Our team will begin by capturing a high-resolution CT scan of your current jawbone structure, which will instruct us on where to place the implants. Then, a non-removable appliance is crafted to attach over the implants immediately after they’re placed, providing reliable function. Typically, you will actually receive two restorations. Once we receive your initial, temporary restoration we’ll begin the Teeth in a Day process. You’ll visit our office, and we’ll remove any damaged teeth. Then, we place dental implant posts, and position the temporary restoration. Once your implants have time to heal, you’ll visit our office so we can place abutments, the attachment pieces, and capture impressions that will be used to craft your final restoration or adjust your temporary denture to be attached to the implant posts. The average price for the Teeth in a Day procedure starts at $18,599. While this is certainly not cheap, it is actually very cost-effective when you consider that the average price of replacing a single tooth with a dental implant starts at around $2,499. However, these numbers are just averages, and it’s important to know that the cost of an implant procedure can vary widely from patient to patient depending on their specific situation. To learn what Teeth in a Day will cost for you, you should schedule a consultation with Dr. Oshidar. What are the Drawbacks & Benefits of Teeth in a Day?